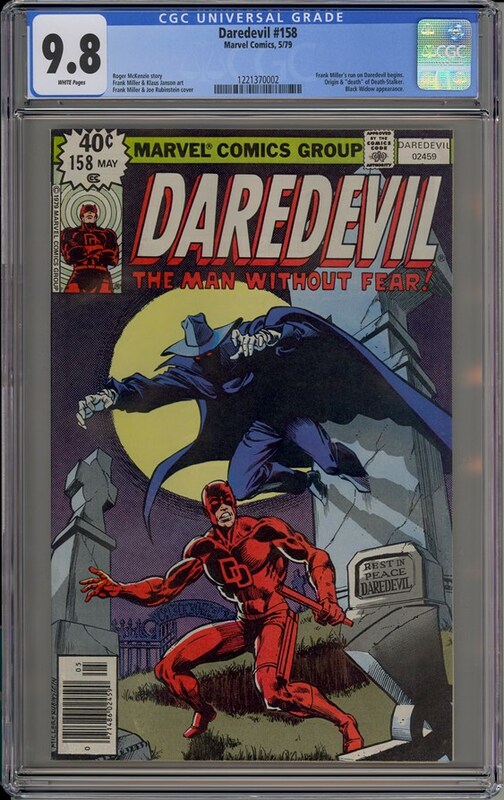 In celebration of Frank Miller's milestone 60th Birthday today (1/27/2017), and in honor of one of our living legendary comics creators, please enjoy the write-up on my copy of Daredevil #158 CGC 9.8 WP, which is featured in my Daredevil #1-#310 CGC Registry set entitled, "See No Evil, Fear No Evil!" -Professor PecoraDaredevil #158 showcases the 1st Frank Miller Daredevil + the origin and "death" of Death-Stalker!Published in May of 1979, this landmark issue is widely coveted by both Bronze Age and Daredevil collectors alike, as the legendary Frank Miller made his artistic debut for the Daredevil title!This classic cover depicts Daredevil standing in the middle of a graveyard in front of his prearranged burial location with the ground hollowed out six feet deep! With an eerie full moon shining brightly against the night sky and with the words "Rest In Peace Daredevil" carved into his tombstone, Miller solidified this chilling image by drawing Death-Stalker teleporting from a stone structure and descending on Daredevil from behind!In addition, with Daredevil's bright red suit, the Daredevil logo outlined in red and with the midnight sky depicted in contrasting purple hues; the colors really pop and make this classic cover very appealing to the eye thanks to a collaborative effort with famed inker Joe Rubinstein!Shortly after issue #158, Frank Miller became one of Marvel's rising stars as he began the process of revitalizing a title that was rumored to be canceled. In fact, beginning with issue #148 in September of 1977, Marvel decided to start publishing the title bimonthly due to lackluster appeal and disappointing sales.However, Frank Miller's success came with some challenges. For instance, he did not get along with former writer Roger McKenzie and even considered quitting the series because he disliked his scripts. After being impressed with a backup story Miller wrote and sensing his unhappiness from a lack of chemistry, newly hired editor Denny O'Neil fired McKenzie and gave Miller a chance to take over both roles as writer and penciler.Enter issue #168 published in January of 1981; not only was this issue Miller's 1st Daredevil issue in which he drew all the artwork and wrote the story, but he also created and introduced a major character named Elektra, who would dramatically change the Daredevil storylines and ignite the title to surging demands! As a direct result of instantly attracting a larger audience, Marvel decided to once again start publishing the title monthly, beginning with issue #171 in June of 1981!After nearly 4 years of Daredevil being published bimonthly and at risk of being discontinued, Frank Miller breathed new life into the title with his multitalented skills and evolved it into one of Marvel's best-selling titles. His cover art is considered some of the best in the title's history and his dark themes and storylines kept the fans craving for more! In addition to creating the enigmatic ninja assassin Elektra, Frank Miller also created and introduced Stick, the Chaste and the Hand during his tenure, all of which are integral characters portrayed in the hit Daredevil series on Netflix.Frank Miller's legendary Daredevil run concluded with issue #191 in February of 1983, for a total of 33 issues! With all that Frank Miller accomplished during his nearly four year run, it's no wonder why collectors will always view Daredevil #158 as a major Daredevil and late Bronze Age Key!In closing, I purchased this immaculate copy from eBay in February of 2016 and was very excited to add this gem to my collection! This 9.8 white-paged beauty is the best-looking copy I have ever seen! It sports PERFECT cover wrap, PERFECT centering and is PERFECTLY cut! The edges are sharp, the spine is drum-tight and the colors are rich and bright!Most copies that have been offered for sale in the market were angled miswraps or you could see parts of the back cover from the front. However, this unique specimen outshines them all and stands in a class of its own!A special shout-out goes to Donna of "outoftheboxcomics2013" on eBay for selling me this bad boy!Happy Collecting!-Professor Pecora To see old comments for this Journal entry, click here. New comments can be added below. Previous entry Wolverine #1 CGC 9.9 WP: 1st Wolverine as Patch! Next entry AND NOW...The "Professor Pecora Copy" of Incredible Hulk #181 CGC 9.8 W! (1st full appearance of Wolverine)!